Ljiljana Jovanović/Becker was born in Serbia where she studied piano and music theory from the age of seven. 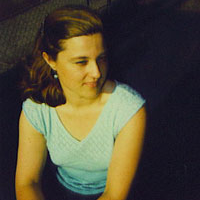 Her principal teachers include Željko Brkanović (music composition], Urlich Süße [musique concrète], Mauricio Kagel [New Music Theatre/Composition] and William Kleinsasser [electronic sound]. Ljiljana also completed graduate studies in interdisciplinary theatre at Towson University in Maryland. She participated at the 2. Tonkünstlerfest Baden-Würtemberg, Rheinisches Musikfest, Documenta IX and MusikTriennale Köln festivals, and was part of The Creator “pro-active, mentoring and cross cultural” TV production in Vancouver, the GEDOK Music Series in Cologne and Women Between Worlds and New Roots, multi-disciplinary & multi-cultural documentaries directed by Exsul van Helden. Ljiljana was awarded two residencies at the Banff Center for Arts and Creativity, Meet the Composer Grant and the ﬁrst prize for an abstract radiophonic form Modi’in by Radio Belgrade, Serbia. Her projects have been performed in Europe, Canada and US. She has been a member of the Baltimore Composers Forum since 2002 [served as an ofﬁcer from 2008 until 2015], and is listed in the Adkins Chiti Foundation: Donne in Musica. Recently her Fifth Mirror [Part I] has been released by Chen Li Music as part of their Pluralities CD.